Chinese manufacturers have stopped using "made in China" labels on clothes sold in Japan in an effort to improve sales, it's reported. 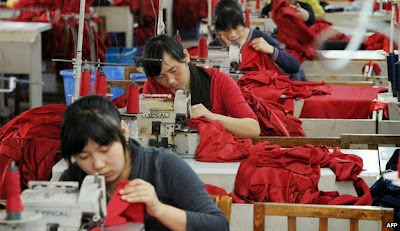 The move is an attempt to overcome perceptions that Chinese-made clothes are poor quality, the South China Morning Post website reports. Instead, clothes are being labelled "made in PRC" - the People's Republic of China - because many Japanese customers don't know what the acronym stands for, the website says. Japan's Consumer Affairs Agency says despite the term being lost in translation, there's nothing to stop Chinese companies from changing their labels. In response, Japan's clothing industry is planning a new label of its own. The "J Quality" tag will be attached to clothes if weaving, dyeing and sewing are all carried out domestically, according to a Kyodo news agency report. It's hoped the tag will encourage people to spend more on "high quality domestic products" rather than buying cheaper imports, an industry official is quoted as saying. Relations between Japan and China have been strained by a territorial row over a group of islands in the East China Sea, and the negative feelings appear to run deep. In 2014, a Japanese think tank report found that 93% of respondents had an unfavourable opinion of China, up 3% on the previous year.